I'm always on the lookout for new veggie burger options to bring along with me when I attend BBQs during the summer months. I never assume that the BBQ host will have vegetarian or pure vegetarian options just for me — though often he or she does — instead, I like to bring along some pre-packaged or homemade veggie burgers and a side dish I've whipped up beforehand. This way, I know I'll get plenty of pure-veggie goodness to eat; and what a wonderful way to introduce other guests to yummy pure vegetarian food. When I spotted a package of Gardein's new beefless burgers at my local organic market, I figured the past holiday weekend would be the perfect time to give cooking them a try, both on the grill and over the stove. They made their way to a grill at a friend's BBQ on Memorial Day; and a few days before, I cooked a couple over the stove for a quick lunch (and this recipe). What I came up with? Beefless Burgers with arugula, tomato, red onion, and Vegenaise; served on kaiser rolls with a fabulous Sesame Tamari Dipping Sauce. Totally delicious — though I seasoned my patties with sea salt and freshly ground black pepper after about a minute or so of cooking on each side instead of using them directly out of the package as I would think most would have the tendency to do. The patties are thick, the texture is very much like a burger made from processed ground beef, and both the taste and texture were acceptable to me. If you prefer meaty veggie burgers over traditional veggie burgers, these might be a great option for you. This recipe pairs well with a brown ale, such as Brooklyn Brewery's. And if you have meat-eaters in the family, they'll LOVE this dipping sauce with their beef burgers, too. Cook the burger patties: Heat the oil in a large frying pan over medium heat. Season one side of each Beefless Burger with salt and pepper, and place patties on the pan seasoned-side down. Sprinkle salt and pepper over the tops of the patties to season the other sides. Let patties cook for 3 minutes, then flip and let cook for another 3 minutes. Flip patties over again, lower heat to lowest setting, sprinkle Daiya on top of patties, cover the pan with a lid and let cook for 4 minutes, until the Daiya has melted nicely and the patties are cooked all the way through. In the meantime, prepare the dipping sauce: Combine all ingredients into a small bowl and whisk to combine. 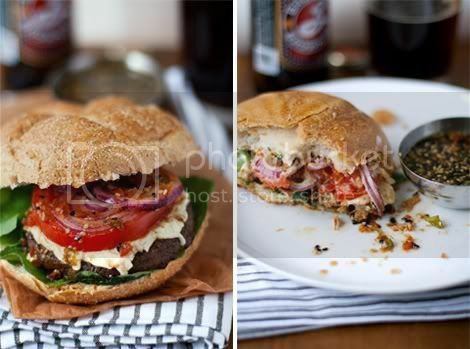 Prepare the burgers: Open a roll on a plate and spread Vegenaise thinly over the inside of each side. 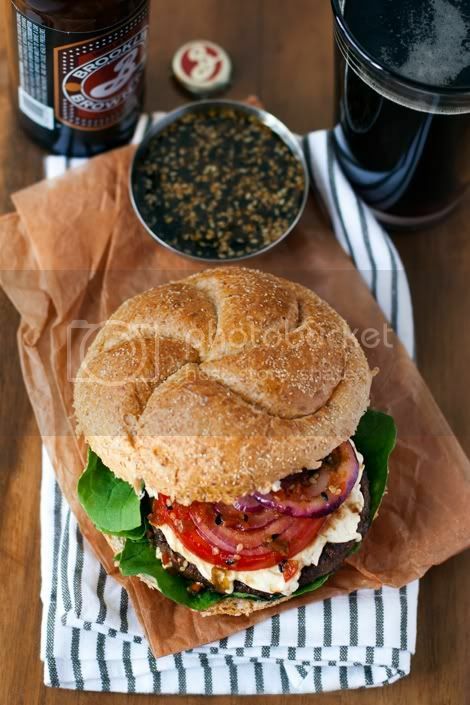 Lay 2 leaves of arugula on the bottom half of the roll, add cooked beefless burger on top of arugula, and top with tomato and red onion. Spoon dipping sauce over each plated burger and cover with the top part of the roll. Do this for each of the 4 rolls. Serve each burger with a small side of the dipping sauce to dip as you eat. For more info on Gardein, and where to buy, visit their website.